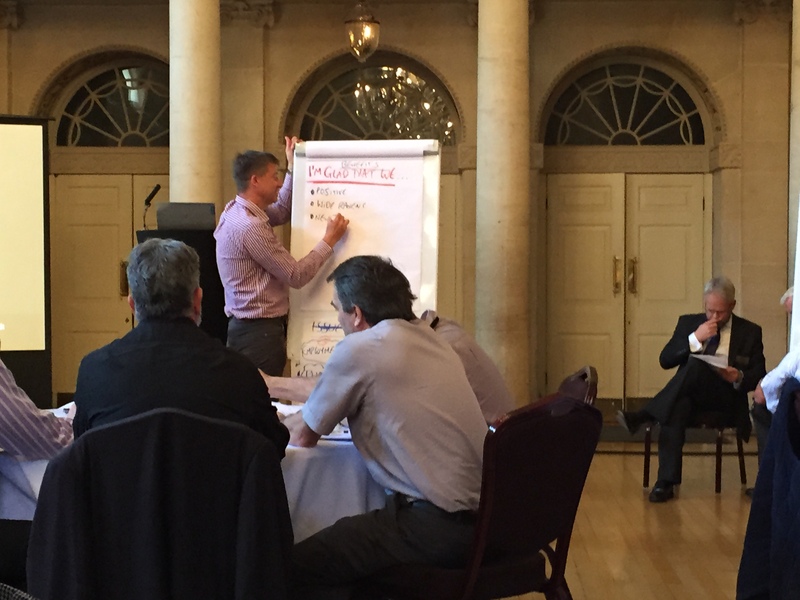 Everything from traffic and bad architecture to waterways and pollution were under discussion today during a ‘workshop’ held at Bath Assembly Rooms to help B&NES formulate a World Heritage Management Plan for the next six years. Some of the local business and heritage organisations gathered at the Assembly Rooms. 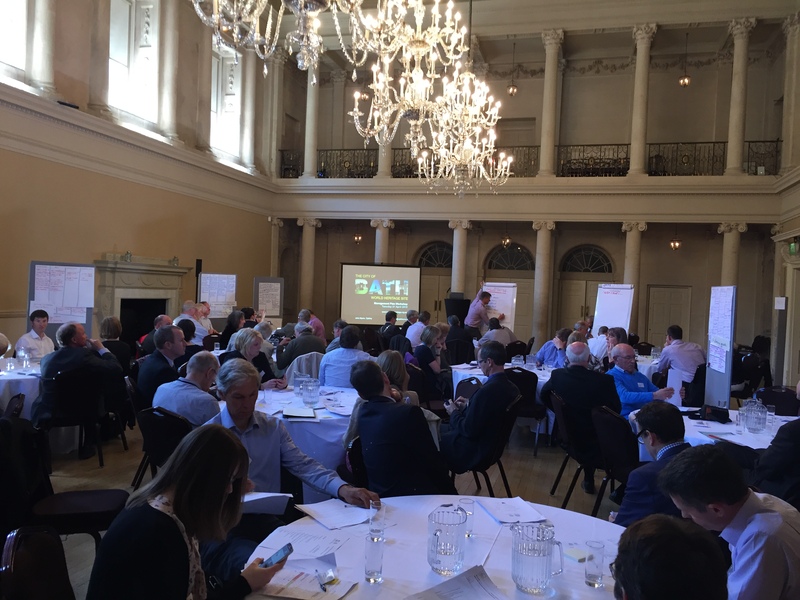 Around eighty people from local businesses and city organisations – including the heritage sector – were invited to take part in a ‘coach-led’ three-hour session to look at the issues affecting Bath – which has been a World Heritage site since 1987. The Chairman of B&NES Cllr Martin Veal addressing delegates.Click on images to enlarge. Bath shares with Venice the accolade of being one of only two European cities in which most of the urban space has heritage status. The city attracts four and a half million visitors each year which helps keep threats down for its 85,000 head of population. The award was granted by UNESCO – which is the cultural arm of the United Nations – and acknowledges Bath’s Roman archaeology, Georgian architecture, its setting and social history. 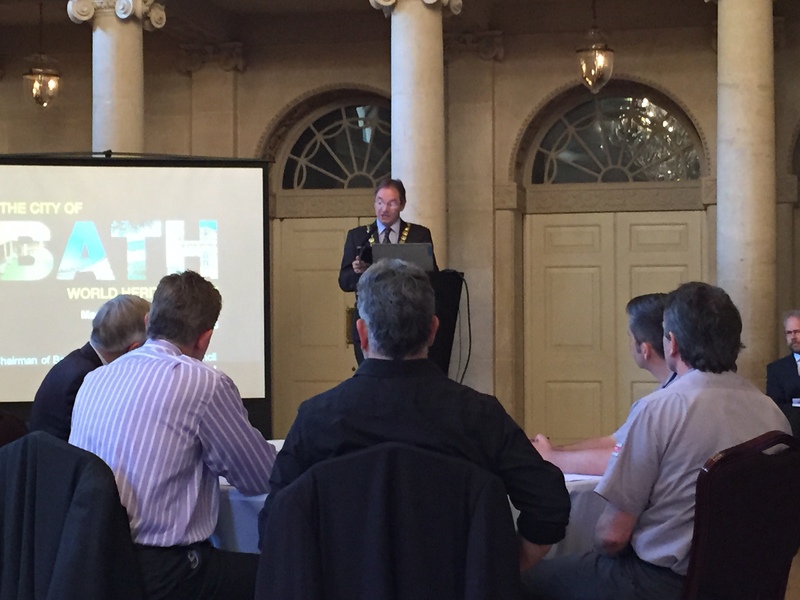 After an introduction by Bath’s World Heritage Manager, Tony Crouch, and a welcome from the Chairman of B&NES Cllr Martin Veal those invited got down to discussing the issues surrounding Bath’s World Heritage status and how best to manage it for the future. Coach, John Myers explains the course of action! It was a high-powered and intense session led by coach John Myers from Optimy. Issues and ideas will be collected and studied before management proposals are put out to public consultation before being considered by the Council and passed to UNESCO. Be interesting to hear what other Bathonias think about the city’s role as a heritage centre and working city.